The most alarming thing that happened in the Peep Hen this year had to do with sailing in quite strong wind gusts, that were blasting in from radically different directions compared to wherever the last one had come from. In this situation, the boat can go a long ways toward ending up right over on its side. Being a Peep Hen, with heavy ballast in its box keel, it does reliably come back upright, but it’s the one situation in this boat where, from my perspective, things really are not fun. It’s worth considering the details on this possibility, if one is inclined to test the limits on this particular boat. Ordinarily, the Peep Hen does very, very well. Especially when loaded for cruising, it’s comfortable, and easy to sail in a perfectly reasonable range of coastal conditions. It’s a little snappy when it’s not loaded, but water, food, and gear for multiple nights take care of that nicely. Twice this summer, both times in harbors in Penobscot Bay, things got more complicated. Both happened in strong, gusting northwest wind. I have friends who decline to sail their bigger boats on those days in this area, and I’m understanding that thinking quite a bit better lately. The first time this problem came up was after a half a day of sailing on a beam reach, going south from Belfast and headed for Rockland. The wind increased as things went along, but the boat was fine. The handheld anemometer showed gusts to about 18 knots, right there at cockpit level, but they arrived more or less from the same direction, and the boat was already making good speed in the steadier wind of 12 to 14 knots. Eventually I put in a reef, which settled things down nicely. A bit later I was working my way into Rockland Harbor, and without realizing it had happened, picked up a lobster trap buoy and its line, hooked on the rudder. The boat steered funny, and was slow, and three times I looked over the stern, expecting to see something amiss, but nothing showed. In the past, hooking a lobster trap line (called a “pot warp” in this area) has stopped the boat dead, unceremoniously turning the bow away from the wind. This day, the wind was so strong that we (boat and I) were towing that lobster trap behind us, all the while tacking into the inner part of the harbor. Good grief. This would have been enough complication for one day (never mind with the problem still unrecognized) but the next thing that happened was that ferocious wind gusts came blasting from the land, toward the mouth of the harbor. Just like that, the boat was well over on its side, and not nearly as inclined to come right back up as is usually the case. Having such high topsides, water did not quite pour over the gunwale into the cockpit, but very nearly. The boat was over well past 45°, but as there is no clinometer (yet!) we don’t have figures for it. Ordinarily it has worked out very well in this boat to sail with the main sheet wrapped in a couple of figure eights around a vertical pin in the tiller. We have used that pin to replace the clam cleat that the boat came with, because the clam cleat was prone to jamming. The pin arrangement is easy to release, but stays put. Fastening the main sheet at all goes against conventional wisdom, which says that on a small boat one should never have the main sheet cleated; rather one should be somehow holding it, so that it can be released instantly in case of problems. My experience with this particular boat has been that it’s possible to get away with fastening the sheet in most situations, because when there is a big gust of wind, simply turning the boat into the wind with the tiller is enough to release the strain and let the boat get back on its feet, which it does immediately. The only situation where I’m in the habit of holding the sheet is if there’s not enough room to make that turn, either because of other boats, the shoreline, or stray rocks and other obstacles. Otherwise, it has worked out fine to have the sheet wrapped on that pin. Not so, on this day! There was of course a cure for this alarming heeling in the gusts: to go back to holding the sheet, so that it could be quickly released when the boat started to get pushed over. It also helped to leave the sail set further out than normal for sailing upwind, and both of these things I eventually did. But it was still shocking to have had the boat go over so far, to put the tiller completely to leeward, and to have the boat not come up immediately, and it took more than one round to begin to figure it all out. It was as if the boat had no headway because of recovering from the previous pushing-over, so the steering had no effect, and the rudder was unable to turn the boat into the wind and let it come back up. In hindsight, it’s also possible that the boat was over so far that the rudder was out of the water anyway. Either way, the lobster trap interfering with forward motion was not helping the situation! Eventually I looked, yet again, over the stern, and this time could see the line stretching down into the water, and the buoy pinned tightly to the lowest part of the far side of the rudder, where it had been well hidden from my vantage point on the other side of the boat. Five minutes later the buoy and its line were popped loose with a boat hook, and the boat was free, though it was still a bit of a project to get to the upwind corner of the harbor where I had planned to anchor. During the worst of this whole production, the wind on the handheld anemometer registered gusts of 22 knots, and sustained wind of 18 knots. Heaven only knows why, with all that going on, one of my priorities was holding that gauge up in the air for its little propeller to catch the wind! Though it can be comforting, because though the numbers are somewhat high, you would swear that the wind was something like 35 or 40, and of course it wasn’t. Seeing those objective figures helps with relaxing about the whole situation. A gauge mounted at the top of the mast probably would have read about 5 knots higher, based on my experience with wind speeds reported by NOAA, but the handheld one is in the ballpark. The biggest question, analyzing this experience after the fact, had to do with whether the lobster trap was the primary cause of the problem, or if the high gusts coming from such different directions would have created all that trouble by themselves. I was happy to live in suspense about this, rather than repeating those particular conditions. There were whitecaps everywhere, in spite of the wind only having a couple of hundred yards of fetch as it came off the land onto the water, and it wasn’t a storm. Sheesh. As it turned out, a few weeks later, again in Penobscot Bay but this time at Holbrook Island, there was enough wind, shifting and gusting, to try it again. Too bad! But it was fascinating. This time there was definitely no lobster trap, and the wind was not quite as strong, but I unfortunately started out with a full sail, with no reefs. Gusts registered 16 to 18 knots on the same meter, but like the previous time, their direction was shifting dramatically, and in between the gusts the wind was barely blowing. In the same way as before, the boat would have no speed, because of the lull between the gusts, and then blam, we would be a whisker away from taking water over the side. On a boat with more average topsides, meaning the part of the hull between the waterline and the gunwale, taking a little water over the rail happens a lot more often, because the boat does not need to be over nearly so far before the rail is dipping into the water’s surface. Because of the design of the Peep Hen, this is not true on this boat – taking water over the side means that your other biggest concern is keeping yourself from falling right out, because the boat is over so far. Though the tiller makes an outstanding handhold. At any rate, during this new rendition of the same test, the original goal was to move across the relatively small, enclosed harbor from the visitor float on the public access island, to my destination of a particularly well-protected anchoring spot a few hundred yards upwind. The breeze had come up quite a bit while the boat was at the float, and although there were no whitecaps the gusts were strong, and shifting dramatically. Setting out from the float it seemed sensible to keep some sail area, in hopes of making progress in tacking upwind to the anchoring spot. Reefing ahead of time would have been better! As it was, once again the boat was being instantly flattened in the giant gusts. Releasing the sheet helped, but because the boat was getting no speed in between being pushed over, it did, indeed, not work to turn into the wind to relieve the strain of the gusts. Extraordinary. This all went on for close to an hour, this second time around, and included putting in a reef and eventually inching up the inside of the island to my anchoring destination. The effort was successful, but not pleasant. I missed AUKLET, both for the junk rig which is so easily reefed, and for the better behavior of the larger boat in this sort of wind. In hindsight, I’ve learned quite a bit, both about how to read the conditions, and what to expect from the Peep Hen based on what I am seeing, as well as about how to judge the options of a particular moment, in order to stay out of this kind of situation in the first place. That’s all to the good, and in fact I’m happy to have had the opportunity to learn all of this. There were many, many sailing days this summer and fall, and only a small part of two of those included this kind of unpleasantness. In both of those problematic situations it would have been possible to make other choices and to have avoided those experiences entirely, if I had known what I was getting myself in for. Now I know! The takeaway from all of this is that strong wind in this boat is okay if it’s something like consistent, allowing the boat to be up to speed for handling gusts. Trying to sail upwind in strongly gusting harbor wind, with dramatic shifts in direction and minimal wind between the gusts, is a recipe for a good bit of difficulty. It’s not likely to be nice in pretty much any boat when that sort of thing is going on, but it’s a real hazard in the Peep Hen. In the future I will sit tight, not pulling up the anchor if those conditions are going on or forecast, and will modify destinations if I’m already out, so as to sail across the wind. Further, if need be I will accept a perhaps rolling anchorage rather than insisting on an upwind attempt at that time. It’s much clearer to me now, where the hazards lie, and as a result those hazards are much more avoidable. The boat is still great. It is after all 14 feet long, and there are limits. It’s good to know more about where those limits are! 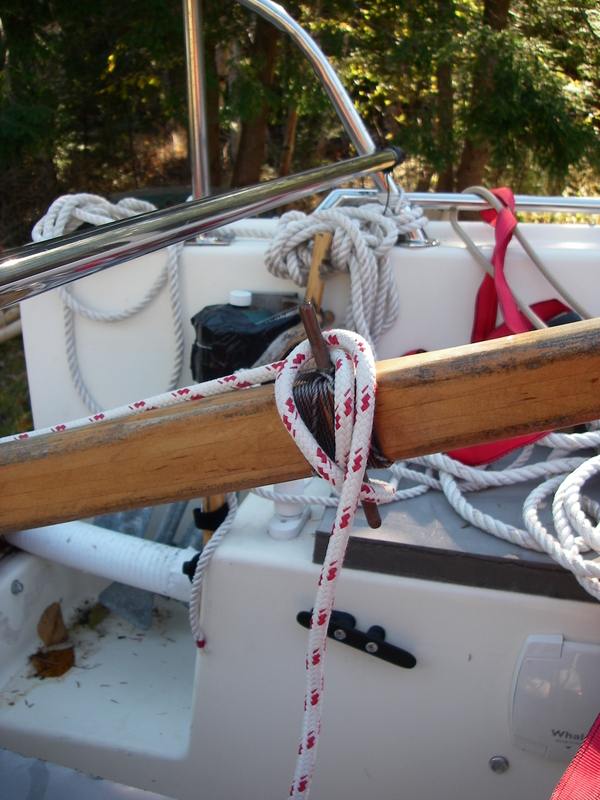 Note: complications with lobster trap lines are also mostly unnecessary, for this style of sailboat, with the addition of a small piece of material at the back of the keel: a section of sail batten or similar plastic, or metal bar, which is fastened to the underside of the keel, and will guide lines harmlessly across the gap between keel and rudder. This is in the works for SERENITY, now that the boat is up on its trailer. It’s great to hear from you! I love these posts — even though I don’t understand the lingo, there’s your typical dry understatement and quirky turns of phrase. I love your writing! Have a warm cozy winter! Another interesting post.I must admit though when I saw you wearing a life vest in enclosed waters I did wonder why, until I finished reading. Hanging onto the tiller to stop falling out of the boat may be classified as extreme sailing. Those on/off conditions are probably among the most annoying in my humble experience, especially inshore where the wind will twist and turn around all the obstacles can find. In some ways there’s no absolute cure for the beast beyond muscling up and screaming abuse at it all – not too loud though. I sail a much larger (26′) full keeler, so not as tippy, but from my reading about other singlehanders’ strategies is that they tend to reef early and often, purely because they are shorthanded. So you’re dealing with a triple whammy; tiny boat, erratic winds and singlehanded sailing. Good on you. Thanks Terry. As for reefing, yes, early and often! And in this particular boat, I’m not going to try to sail upwind in those conditions again, unless there is dire necessity. In the first example in that post, I rejected, and passed by, two possible anchorages that would have been less than perfect but entirely serviceable and safe – I would do that the other way, in the future. The second example was even more ridiculous – I was originally anchored in that good spot, before the wind picked up, but wanted to go over to the island access. In spite of the forecast for the strong wind coming up later, I pulled up the anchor and sailed over to the float. Could’ve anchored perfectly safely near the float afterwards, too, but had the idea that I wanted to go upwind back to that other spot. Now I have so much more information to put into a decision-making process like that! Either way, I do miss the junk rig, especially for the easy reefing, and am looking forward to sailing the other boat this coming year. Happy summer for you, starting now! I hope you’re getting in lots of good water time. Dear Shemaya, I was having the same trouble getting knocked down in gusty winds and finally happened upon one simple change that made all the difference. The key adjustment turned out to be whether the mainsheet was cleated to the centerline of the boat, or down to the leeward rail (using the traveler). With the mainsheet cleated to the centerline, the rail would go under in gusty conditions, just as you describe. However, with the traveler all the way out, even if the main is sheeted tight to the traveler, the boat rounds up reliably every time. Sailing 101 in hindsight, but learning it by experience increased my confidence, to say the least. If this is not something that occurred to you on that gusty day, I hope Peep Hen is set up in such a way that you can try it. That’s so interesting about the traveler. What kind of boat do you sail? The Peep Hen design doesn’t have a traveler, but it’s intriguing, thinking about your experience. They say that it flattens the sail, and removes twist, to adjust the traveler down like that. I’m going to think on that some more… And it’s wonderful that you’ve found the cure for that situation on your boat! It’s like the centerboard thing and tacking – you get the adjustment right, and bingo it’s like a different boat. My boat is a daysailer designed by French naval architect Francois Vivier, but I sailed a sharpie for many years. I don’t know enough about your Peep Hen to be definitive, but if you wanted to test the effect, it should be possible to rig up a simple rope traveler to get the sheeting point out near the rail. That’s what I had on my old sharpie. The boom gallows you have may interfere however. Your sailmaker, Stuart, would likely have something useful to say. Well, you have the winter ahead to think about it. Good luck. The designs by Francois Vivier are wonderful – which one do you have? 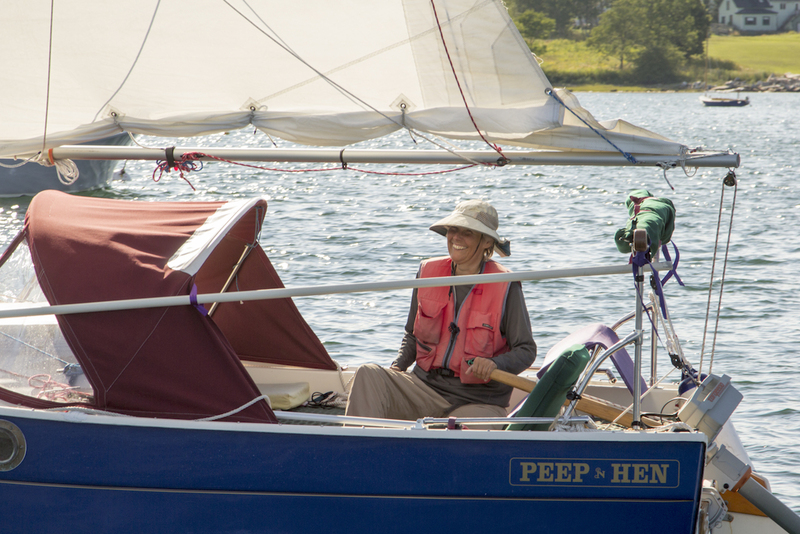 Putting a traveler on a Peep Hen would be less than simple – the entire sheeting arrangement would need to be rearranged, because of the way the sheet goes to a block at the back end of the tiller, and then runs up the tiller. Which has advantages of its own… I think that if I do a substantial change, it’ll be to a junk rig, which sheets differently again. But like you said, there’s all winter to ponder! Thanks again for sharing your experience, and adding all this great food for thought. A junk rigged Peep Hen? That would do it! My boat is the Stir Ven 22. I was out sailing yesterday and experimented with the traveler some more (the traveler is not identical to M. Vivier’s design). She has three reefs in the main, but I call moving the traveler out and flattening the sail “half a reef.” But who knows if the effect would be significant on your boat, and as you say, making the permanent change is not so simple. No doubt time will reveal the answer, if you sail her enough. Thank you for these Peep Hen posts. Your writing and imagery are very good and it’s fun to picture the same things happening on my Peep. She’s rigged with a boom vang that helps keep the main sail more manageable in a manner somewhat similar to a traveler, i.e., keeping the main from developing too much twist. One cannot crank it down too much though or the boom could hit the gallows coming across. I mostly just set it in stronger wind to prevent the boom rising and then leave it alone. I haven’t had as much practice or experience with that compared to your summer though. Happy holidays! Oh gosh – I’ve been much too long in replying! Thank you so much for your lovely message. I’ve thought about the vang question also. That’s great that it’s working out well for you. Besides flattening the sail, it would be very helpful to avoid the boom rising. The prospect of a “goose wing jibe” has given me real pause a couple of times, and that vang would of course be the cure. It’ll be wonderful to hear more about your own trips, as you get out more in your new boat!